Yep, the same watch as in the advert up top. 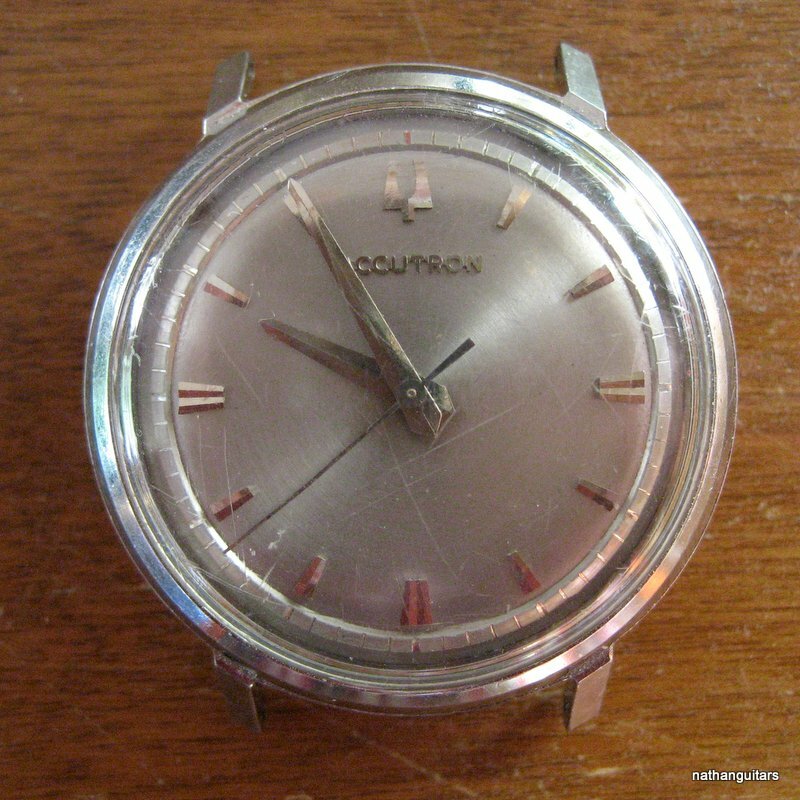 Made in 1968 or thereabouts, this was the cheaper baby sister to the Accutron, and it has a Japanese made movement made by Citizen. 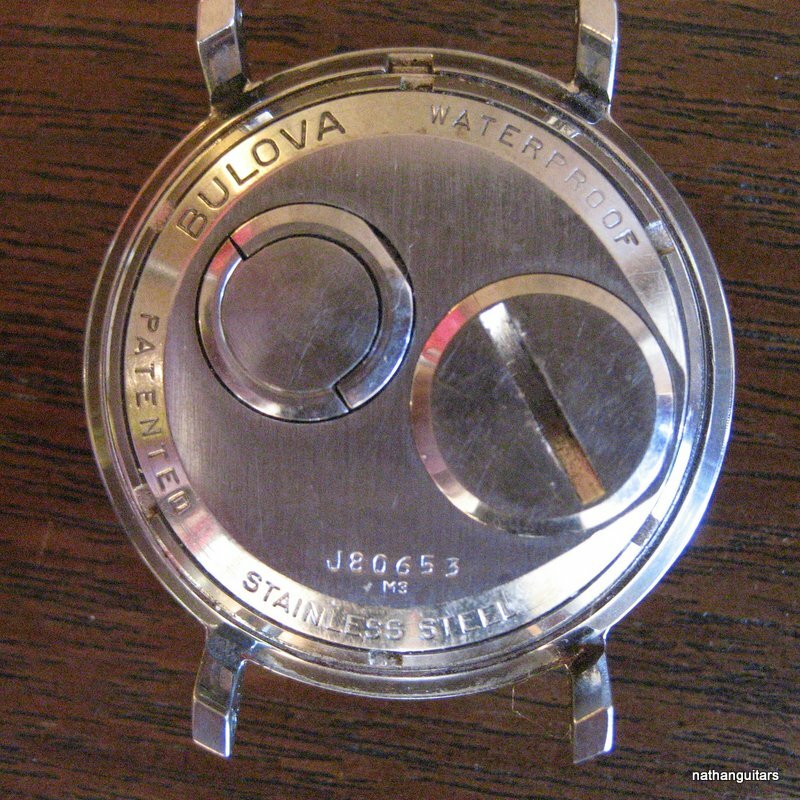 This is a hybrid between a regular windup watch and an all electric one, having a complete movement minus power spring. Instead of a spring it has a tiny motor. The battery is a standard 1.5 volt affair, still available today. 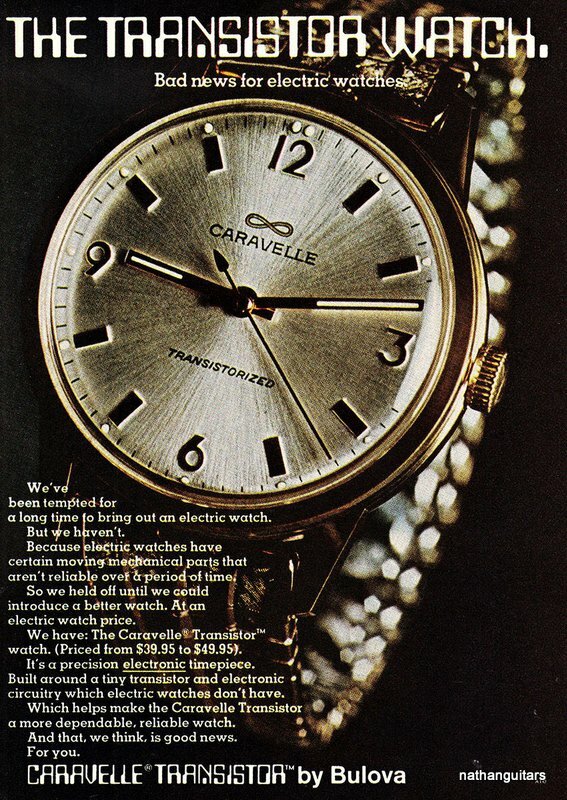 I opened the watch and removed the dead battery which may well have been the original one, since it had the name Caravelle engraved right on it! For $2 I got a pack of 5 alkaline cells, and installed one in the watch. At first it didn’t run, but that was due to the bottom of the cell shorting out against the innards. I put tape on the base of the battery and cut a small slot for the contact, then replaced it in the watch. It started up and has been keeping perfect time ever since. It ticks like a windup watch, too. 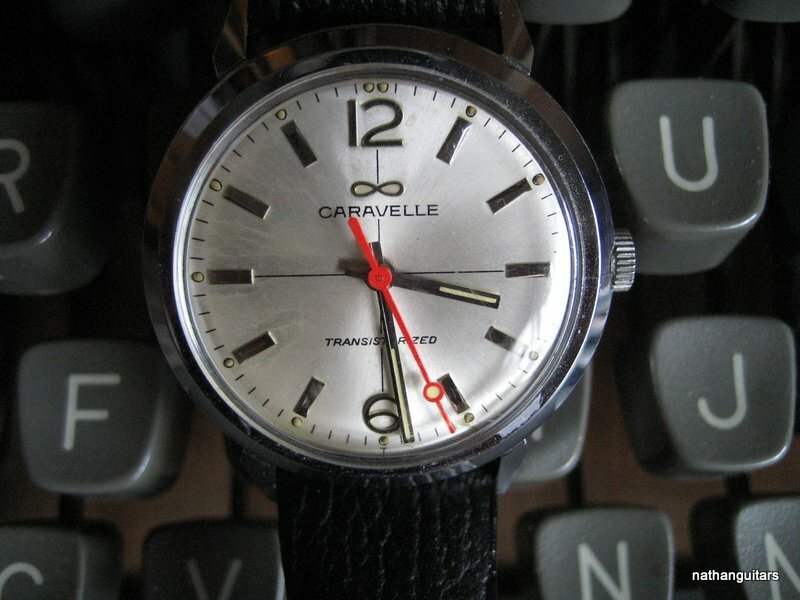 The question is, which watch proved to be the better one in the long run? Here’s the Accutron. It said waterproof, and it was – I swam with it for years. I wish I could get a cheap battery for it. no stem, it’s on the back! I took the shell off to clean and adjust this one. The automatic ribbon reversal mechanism on the right side was jamming so the ribbon would get taut at the end and not reverse. After some examination I saw the problem, and fixed it by filing off the point on the plate attached to the ribbon flipper, so it no longer hit the arm it was supposed to push over and thereby flip ribbon direction. Aside from that I blew out the dust and gave it a spray of silicone lube. It’s from Britain, and has many fractions but no exclamation mark. How British – no exclamations… only stiff upper lips, hmmm? I get great results with Olympia portables (the baby ones) by using old mylar ribbons. I drop the spool onto one side and thread the ribbon onto the opposite spool without going through the flipper gates. Half the mylar will fill up one regular empty spool, after which it can be turned over and reused on the bottom section. 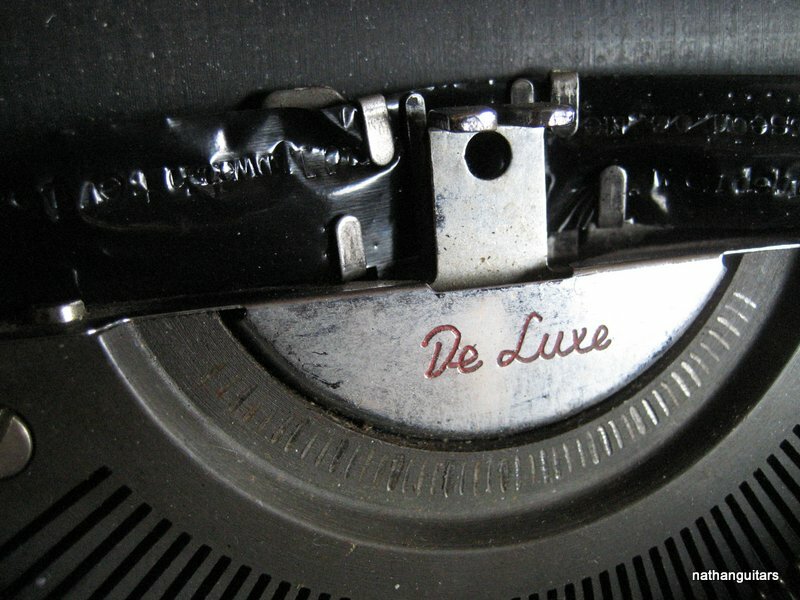 I’ve tried mylar on some other typewriters and it doesn’t work well on every machine, but works perfectly on these. We visited the garden last week to look again at the plot and think about what would have to be done to get it ready for planting. Margie said we needed a pitchfork. Then we got to talking about the patron saint of gardeners, St. Fiacre. He’s also the patron saint of taxi drivers from an odd twist of fate having to do with where taxis used to come from in Paris, near the Church of St. Fiacre. Fiacre was born in Ireland in the 9th century, and his brother and he both became saints. So we began joking about St. Fiacre, as if he might be listening. Jokingly about divine intervention we hit a few thrifts but didn’t see one pitchfork, although I did see an alpine ice axe. As we left I noticed a man buying it. No serious mountaineer would trust his life to a used ice axe; that I am certain of, as I am also certain the man was therefore no serious mountaineer. That made me wonder what he was going to do with it. Maybe he had a garden and planned to use the cutting end to hoe at the earth? Was he too seeking a pitchfork? We checked out two stores where they sold new pitchforks. The first was $25, but M thought it was very heavy. I held it in my hands and had a look at it. On the fork part was stamped the word ‘Austria’. The handle was oak, and very thick. It was heavy duty, for sure. Next door a garden shop had one for $60. The handle was oak, but stained. I looked at the fork and there was the word ‘Austria’ stamped into the steel. This is the same tool with some more varnish, I said, hanging it back on the wall. They’re both too heavy, Margie said. 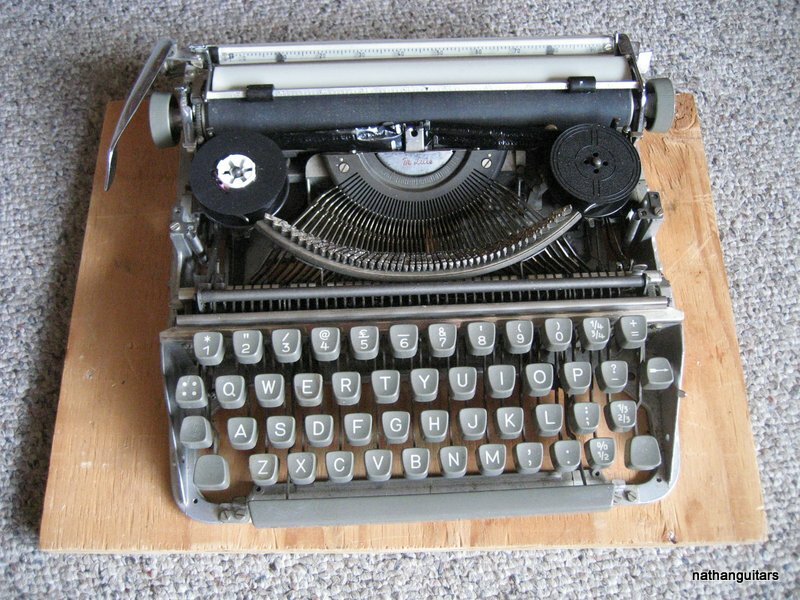 I want one that’s lighter, the sort I remember from long ago. We came home with a bag of seed potatoes and a garden gnome. Later, Margie went to another garden supplier that had another heavy pitchfork for $100. She went off to sing with friends and I went out to do errands. I decided to go down to the big thrift shop that’s always open. I hadn’t been there in a week due to the snow we had here, so it was time for a look see anyhow. I walked down to the back and saw a large cardboard barrel in which there were some shovels. Then I saw a cultivator. Thinking that might do for turning up dirt I lifted it out of the barrel, and saw that it was $5. Not bad, I had one useful gardening tool. There were several shovels too, nice ones, but we didn’t need any, so I resisted purchasing a cheap shovel. Then I had one last look, and saw a red D handle of something that I assumed was probably an edger. 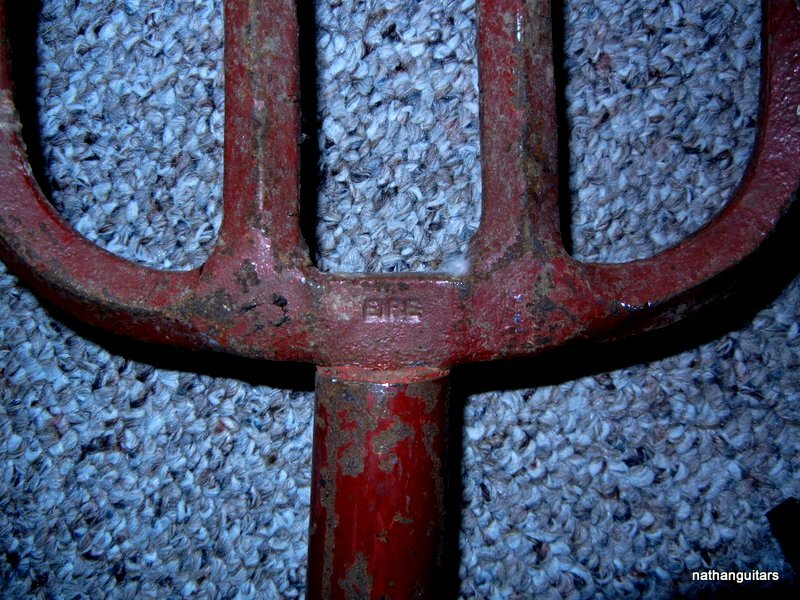 I grabbed that and lifted it up when to my delight I recognized the prongs of a pitchfork, just like the one that stood in the corner of my parents’ garage 50 years ago. True Temper was stamped on the shaft, which was oak, but much thinner than those we’d already seen and rejected. The fork itself was lighter, too, with tines chamfered to reduce weight and make it easier to plunge into soil. The whole thing was half the weight of the modern ones we’d seen. It was $6. I decided to look where the others had been stamped, and there I saw the word ‘Eire’. Ireland, birthplace of St. Fiacre. 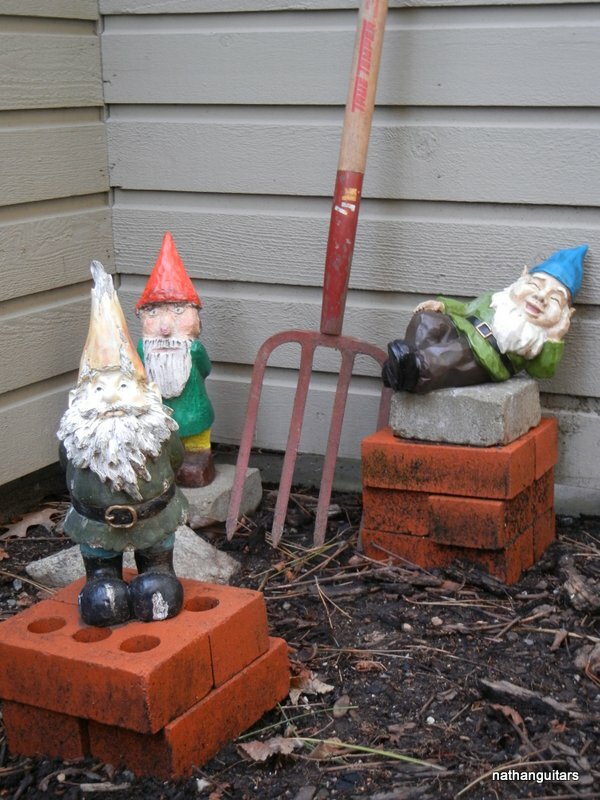 In honour of our good fortune we named the new gnome Fiacre. 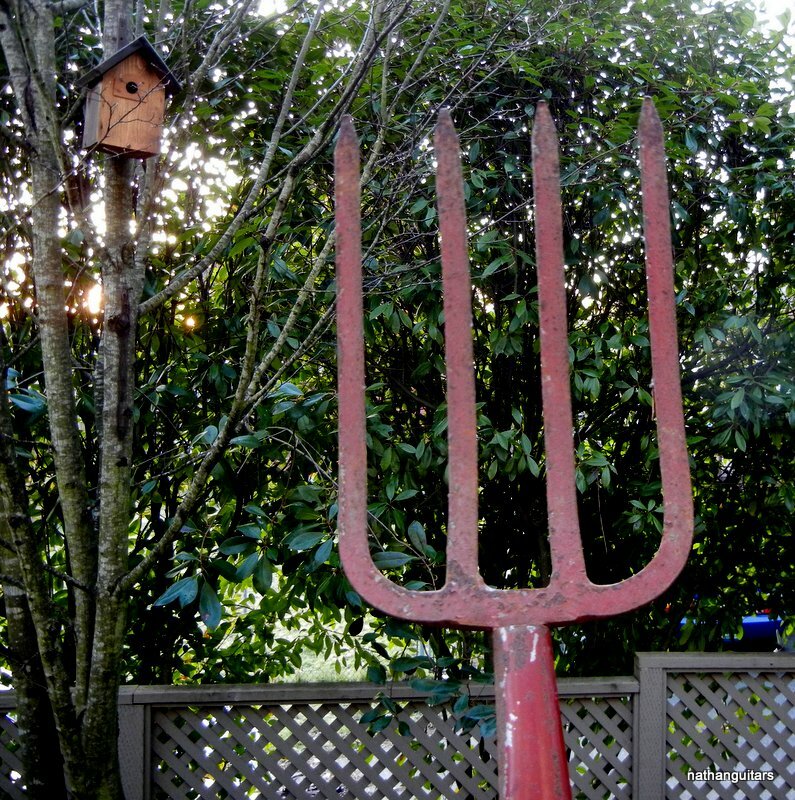 By the way, it’s not really a pitchfork, it’s a garden fork. The devil carries a pitchfork. It’s probably stamped ‘Austria’.